JENNIFER Boucher joined the Army in 2004 and qualified as a Groundcrewman in the Army Air Corps. She fell in love with Airtrooper Alistair Boucher whilst they were training in Middle Wallop. After spending the first few years apart, the couple were married in August 2007 and served together at 1 Regiment Army Air Corps in Gütersloh, Germany. Life was blissfully happy for the pair and Jenny looked forward to a successful career in the Army with her husband. Within a year, both Jenny and Ali were deployed to Iraq for a six month tour, to carry out force protection in Basra. But in December 2008, Jenny was forced to return from theatre having been diagnosed with cervical cancer. She underwent an operation to have a section of her womb removed and was told by doctors that she would not be able to have children. This came as a huge blow to the pair and Jenny was devastated. In 2010, Jenny fell pregnant for the second time – all her hopes and dreams were being fulfilled. But it was a difficult pregnancy and things soon started to go wrong. The doctors at the Gilead hospital in Bielefeld, Germany, did everything they could but in June 2010, at just 28 weeks, her baby died in her womb. The loss of baby Ella hit Jenny hard and she was placed in a psychiatric ward where she was treated for PTSD and depression. Against all the odds, in late 2010, Jenny became pregnant for a third time. Unfortunately there were again complications and a ruptured placenta caused baby Raya to be born via an emergency caesarean section at the Gilead hospital. Raya was premature, born at just 26 weeks old. She was frail and helpless and they feared the worst. At six months old, Raya was diagnosed with holes in her brain and the doctors assessed that she would never walk, talk or feed properly. It was a tragic development and threatened to crush the family’s hopes and dreams for the future, but it proved to be a significant turning point in her life. The Great Ormond Street Hospital (GOSH) in London is an international centre of excellence in child healthcare. Each year, there are more than 200,000 patient visits to the hospital to in excess of 50 different clinical specialties. Finding new and better treatments and cures for childhood illnesses has always been central to the hospital’s work. Raya was transferred to Great Ormond Street, where she was treated by some of the best paediatricians in the country. A series of scans revealed cysts on Raya’s brain which could be removed. Several operations later and Raya was making a full recovery. “The doctors and nurses at Great Ormond Street were fantastic and if it weren’t for them, my Raya would not be the child she is today,” Jenny said. Raya is now two-and-a-half years old and she enjoys a perfectly happy, healthy normal life with her older brother. Great Ormond Street does such an amazing job and has saved and improved the quality of countless babies’ and young children’s lives for many years. Jenny wanted to give something back and to show her appreciation. Despite her ordeal and the tragedy she had suffered, she felt compelled to help. Jenny began fund raising for the Great Ormond Street Children’s Charity. She organised face painting at children’s parties, sweet fairs, raffles, car boot sales, bag packing in the NAAFI and even donated money she had earned from her part-time beauty salon – anything that would help give babies and children a brighter future. Thanks also to a generous donations and support from 1 Regiment Army Air Corps, she was able to organise a families day, where Army Air Corps personnel and their relatives could enjoy pony rides, stalls, games, a bouncy castle, refreshments and a ride in the Lynx helicopter before flying in Germany ceased in September 2013. Jenny would periodically send cheques to Great Ormond Street, knowing that she was doing her bit to help others. Over a period of 15 months, Jenny has raised in excess of £5,000. Capt Philip Gray, AGC (SPS), attached to 1 Regiment Army Air Corps, decided it would be a nice idea for Jenny to present her latest donation to the hospital in person. 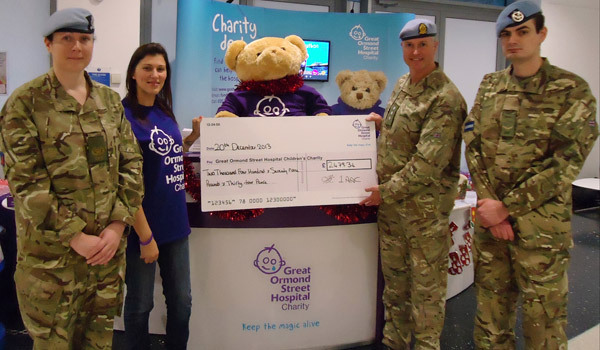 On Friday 20 December 2013, a small group representing 1 Regiment Army Air Corps visited Great Ormond Street Hospital and presented a cheque for £2,479.34. They gave out gift bags, kindly donated by the local Armed Forces Recruitment Centre, and had the opportunity to speak to some of the children and their families. They are truly remarkable children with very brave and supportive parents. Every year, the hospital needs to purchase replacement or additional medical equipment. This enables the clinical and research teams to benefit from advances in medical science and technology to deliver better care to children and to replace old equipment that is no longer fit for purpose. Approximately 1,200 patients per year are admitted to GOSH’s Paediatric Intensive Care Unit. The money raised will go towards purchasing equipment that will improve the lives of young children and, more specifically, saving the lives of new born babies, something which will always remain very close to Jenny’s heart. “I am just so pleased we have been able to give these helpless babies and children a chance in life, I feel complete now,” she said.